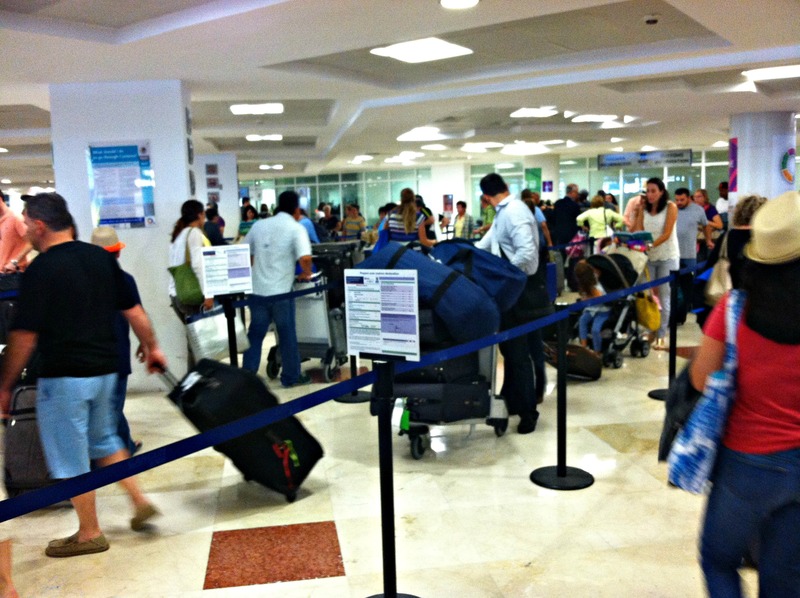 Tips To Get You Through Cancun Customs Fast! Posted March 2nd, 2017 by Jessica Garcia & filed under Uncategorized. You’ve been planning this trip for months and looking forward to the white sand beaches, turquoise waters, adventures, fun, and relaxation. We understand you want to get to your hotel, and the beach, as quick as possible. If this is your first time traveling out of the country then you’ll need to know about traveling through customs. While it’s pretty simple, there are a few tips and tricks that will help get you through a bit quicker, and we’re here to share them with you. On the plane ride in you will be given two forms. The first form will be asking for your personal information, flight information, and resort information. On the plane you should have handy: a pen, your passport, and the address of your resort. The flight attendants will announce your flight number to help you fill out that part of the form. #8 on this form throws many people for a loop, unless you are a temporary resident or permanent resident holder you don’t need to worry about this section and can leave it blank. The most important thing to know about this form is that there are two parts that need to be filled out. The top section, and the bottom section. As you exit the plane, an agent will be checking your forms to make sure they are completely filled out. Most likely some of the travelers on your plane forgot all about the bottom half of the form and now have to stand in a hall way to fill it out, while you can walk on by and go downstairs to customs. 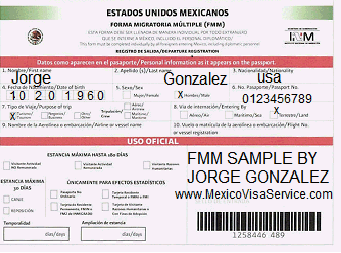 The second form that will be passed out to you will be a Customs Declaration form. Only one of these forms should be filled out per family. The head of the family can be the person to fill it out and it’s pretty straight forward but you should remember that you’ll need to sign it on the back. You should always be honest on all forms and be reassured that if you have any additional questions you can always ask your flight attendant for help. As you arrive downstairs you’ll see many lines being formed, try to choose the shortest one. You’ll need to have your passports and INM Form (Green) ready and will go to the window as a family. 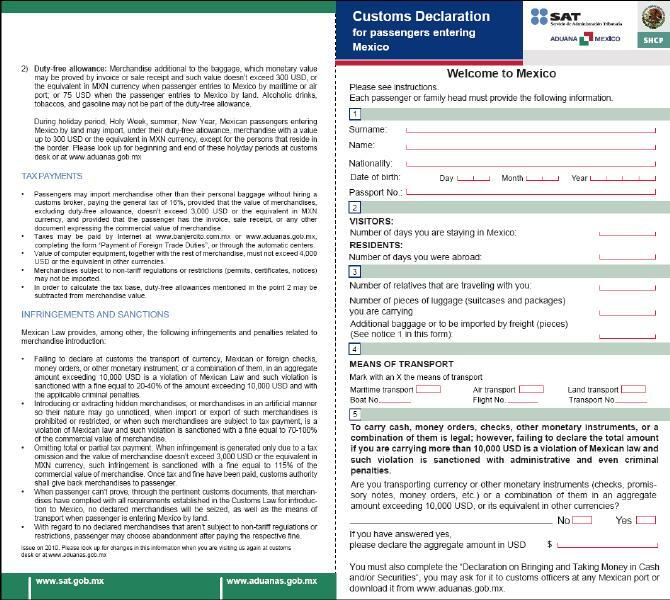 Don’t worry about presenting your Customs Declaration form here, that will be given at a later time to another person. Once you see an agent they will ask you a few simple questions about how long you are staying. After you get your stamp and the bottom half of the form back you’re free to go collect your luggage, use the restroom, and even shop at the stores available by baggage claim. After you have your luggage you’ll want to have the Customs Declaration form ready as well as your passport. You’ll again get into another line and when it’s your turn hand over the paper and they will ask you to push a button. If the light turns green you’re free to go, if it turns red you have been selected for random “search”. They will put your luggage through and X-Ray machine and ask to see inside your carry on bag or purse. Once this is done, you should be free to go. If you have a car reservation, they should have given you instructions on where to go and how to find them. Try not to get caught up, unless you want to, with all the people selling you things as you walk out of the airport. 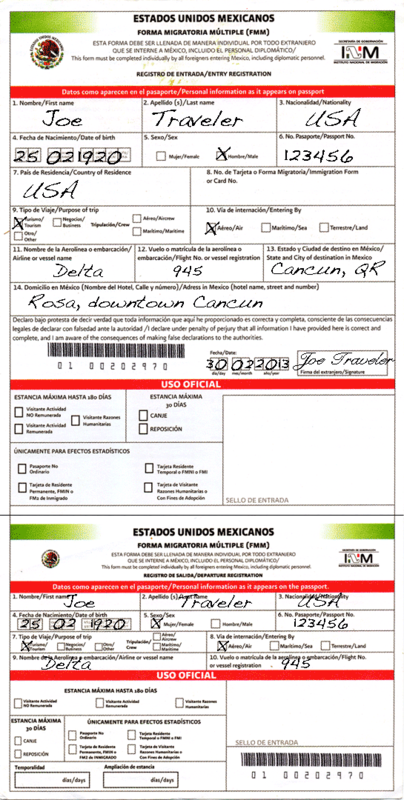 The INM Form that was handed back to you is your exit “ticket” out of Mexico and should be kept in a safe, dry place during your vacation and presented to the agents at the airport when you checkin to leave. If you don’t present this when leaving you’ll have to pay a fine to get a new one. Now that you know the ins and outs of customs it’s time to get you here A.S.A.P. Discover all of our incredible packages now!